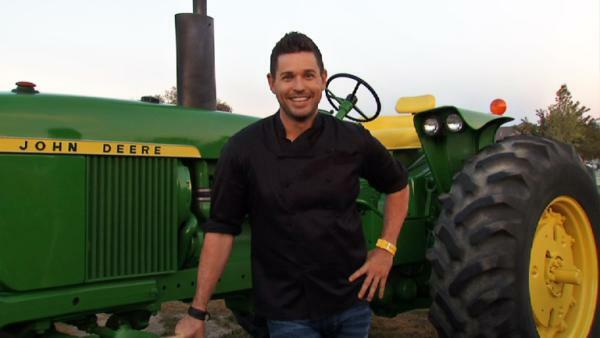 Chef Ryan Scott travels to Fallon, Nevada, to cook up a farm-to-table feast for 125 people. He uses local ingredients to make tasty dishes -- such as gazpacho and maple ice cream with bacon brittle. Chef Ryan Scott is undertaking a huge challenge today -- cooking a four-course farm-to-table feast for 125 people in Fallon, Nevada. Fallon is a small agricultural town outside of Reno. U.S. 50 runs through Fallon, and it's known as one of the lonliest highways in America. The feast is going to be served in park, so in addition to cooking the food, Ryan has to transform the park into a dining room. The food prep will happen at a nearby restaurant, the Slanted Porch, owned by Ryan's friend and mentor, Chef Steve Hernandez. All the ingredients for this dinner were grown within 5 miles of where they will be served, and they have less than 24 hours to do it. "That's the focal point of this thing, to minimize fossil fuels - the beef, the pork, all the vegetables - everything," says Steve. Steve and Ryan get started by picking the beets they need for the dinner in Steve's hoop house, just a few feet from the restaurant. Everything is grown in an organic soil they make themselves. Ryan is surprised by how quickly they can grown fresh organic veggies like beets and turnips, inside the hoop house. But Steve doesn't have all the ingredients they'll need for their dinner, so Ryan heads to Workman Farms to meet farmer Wade Workman who grows melons. He introduces Ryan to two varieties of melons - the Heart of Gold and Sarah's Choice. Sarah's Choice is a widely grown melon - easy to grow and pick, but Heart of Gold is an heirloom - a difficult to grow and pick melon that has an amazing taste. Ryan decides to go with the Heart of Gold melons for his salad for the dinner. Back at the restaurant, Ryan works on a flavorful rub for the meat they're going to roast. He grinds whole spices to get the most flavor. After working a long night, Ryan heads to another farm to get more ingredients for their dinner. At the restaurant, food prep continues and tents begin to go up at the park where the dinner will take place later that day. But Ryan is at Lattin Farms, a roadside produce stand offering organic food and fields of sunflowers. Ryan wants to pick up vegetables for a salad and for gazpacho - a Mexican soup. Owner Rick Lattin tells Ryan about how his favorite heirloom pepper was brought to the United States by a Romanian acrobat who couldn't find the pepper he wanted to eat, so he went back to his home country and brought seeds back with him. "Wow, that's sweet," says Ryan, tasting the pepper. "This just beats up the bell pepper. There's nobody even close to this." Ryan picks up a case of the peppers and a case of lettuce and heads back to the restaurant to work on the rest of the dinner. At the park, Steve has been slow roasting a side of beef for 16 hours. Next, Ryan cuts peppers, tomatoes, and scallions to create a delicious Mexican gazpacho. "Basically, it's a Blood Mary with no vodka," says Ryan. But at the park, a problem arises. The team doesn't have the right plates so the soup and salad courses can't be sent out together. Back at the restaurant, the team finishes the food and makes sure they have everything before they head over. "I can honestly say we've got everything," says Ryan,"And if we're missing it, it's Steve's fault." Steve found extra plates so that the soup and salad can be served together, so that solve one problem. But there's still a lot to do, and 125 hungry people waiting to eat. In order to lift and carve the 80 pound piece of beef Steve has roasted for the meal, they have to use a tractor! The first course is house-made proscuitto with melon and a honey vinaigrette. Next, the gazpacho and side salad, all served on one plate. After that, the meat and corn with cilantro butter gets served up. To go with the meat is a local potato, grilled to perfection with scallions and creme fraiche. For dessert, a maple ice cream milkshake topped with bacon brittle. Overall, the dinner is a success and the crowd loves it. Ryan and Steve toast and congratulate each other on a job well done. Use this make-ahead rub on any meat, poultry or vegetables. The longer it marinates, the more flavorful the bite. Easy and refreshing summertime soup to start any meal. A classic summer barbecue dish with a delightful flair. Well balanced, mild vinaigrette to complement any summer fruit or green salad. Sweet and savory dessert that will please any crowd. Go behind the scenes as Chef Ryan Scott visits Fallon, Nevada and cooks a farm-to-table feast for 125 people.